All photographs and text by Artur Conka - Mandatory Credit: Artur Conka / UnFrame. Non exclusive use only. What is life really like for Roma families around Europe? My journey from the largest Slovak Roma community to London and back. You can't miss Lunik IX, but most people avoid it at all costs. It is a dilapidated block of flats in the western part of Kosice in Slovakia that receives no gas, electricity or running water. It is surrounded by garbage bags that rarely get picked up by the council, and the windows that cover its façade have been stripped for scrap metal and wood to provide meagre income for its inhabitants who are estimated to number ten thousand, three times the number planned by when Lunik IX was built in 1979. The many men, women and children that play and meet on the surrounding streets do not look dangerous, but they are all Roma and that is reason enough for many of the local white population to steer clear. 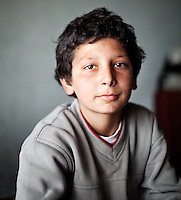 Current government statistics estimate that there are over 106,000 Roma or about 5% of the Slovak population. 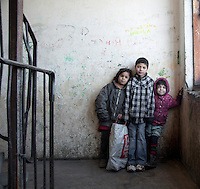 Most of the Roma live in poverty and with limited employment, eduction and housing.